Some 200 Jenkintown residents, many of them elderly, are losing their apartments due to a dispute between local officials and the property owner. Jones has lived in the Colonade high-rise apartments on Old York Road, in the Jenkintown section of Abington Township, for 16 years. He and other residents have had a string of complaints about leaks, electrical outages, broken elevators, cold water, broken heaters, and other issues, many of which ended up in the courts. In 2012, the building was cited for more than 200 code violations, and the township’s solicitor was “looking into criminal charges,” according to an Inquirer report. Norristown, PA – The Montgomery County Commissioners have released the new dates for the “Conversations with your Commissioners” town hall meetings that had to be postponed because of the spate of bad weather over the past few weeks. Wednesday, March 5 at 7 p.m.
Saturday, March 22 at 10 a.m.
“We urge residents to attend these conversations so they can hear what we have tried to do during our first two years in office, and we can hear what issues are most important to our residents,” Shapiro said. For more information please call the Commissioners’ office at 610-278-3062. Norristown, PA – The Montgomery County Commissioners have scheduled a series of six “Conversations with Your Commissioners” throughout Montgomery County during February. Last year the inaugural series of “Conversations” was extremely well-attended and gave residents of the county the opportunity to discuss a wide range of subjects with the commissioners. The 2014 series of conversations will be held in Lower Pottsgrove, Abington, Ambler, Bryn Mawr, East Greenville and Norristown. Shapiro said the commissioners plan to use the sessions to review what the county has done during the first two years of the administration and outline what plans are in store for the final two years. Thursday, February 6 at 7 p.m.
Saturday, February 8 at 10 a.m.
Monday, February 10 at 7 p.m.
Saturday, February 15 at 10 a.m.
Monday, February 24 at 7 p.m.
Thursday, February 27 at 7 p.m.
ABINGTON TOWNSHIP, PA (AP) – A community just north of Philadelphia could become the first suburb in the state to install red-light cameras under a new law allowing the devices to be used outside Pennsylvania’s largest city. Township commissioners in Abington voted 14-1 last week to install the devices at three busy intersections, according to the Bucks County Courier Times (http://bit.ly/1aLzeDO). The plan still requires a final green light from the state Department of Transportation. For the past eight years, Philadelphia has been the only place in Pennsylvania where surveillance cameras can snap pictures of cars that fail to stop at red lights. Scofflaws are fined $100. CNNMoney.com has released its 100 Best Places to Live list. Nearby Abington Township was rated the 29th best place to live in the United States of America! That’s pretty awesome! Abington Township is the home of the Willow Grove Mall and the Keswick Theatre. Abington Township is a 30 minute commute from Philadelphia and has a population of 54,000 people. 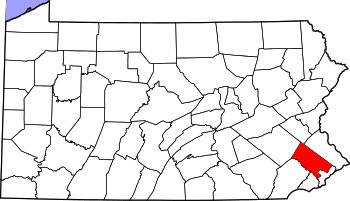 The other Pennsylvania municipality that made this list was Millcreek Township which is Erie’s largest suburb with 54,000 inhabitants. Millcreek Township came in at number 79. Erie International Airport, Presque Isle State Park, college, graduate school facilities and the Millcreek Mall Complex are located in the township. The Millcreek Mall Complex features 175 stores and restaurants. Upper Peach Street runs through the township and is the most significant center of urban sprawl in Erie County and features at least seven shopping centers. The locals refer to Peach Street as Peach Jam because of the traffic around the shopping centers.